Tymon Mellor: The mine at Lin Ma Hang was the most advanced mining operation in the colonial era of Hong Kong before the Pacific War. However, like many mining ventures, this one had a slow and difficult start. This article explores the discovery and early years of the mine’s development along with the workings that are still visible today in the area. This article discusses the abandoned mine workings at Lin Ma Hang. These workings are extremely dangerous with unsupported tunnels, open shafts and mine waste stored above the roadways; the workings should not be entered. 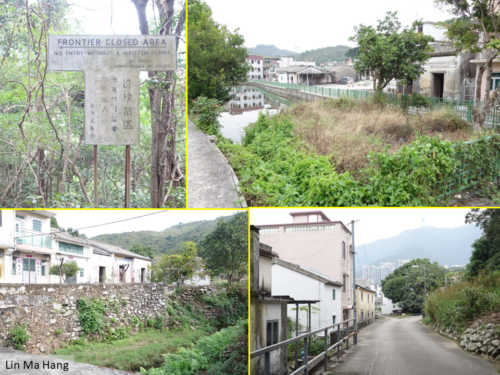 There are not many areas in the New Territories as isolated as the village of Lin Ma Hang. To the north of the area is the Sham Chun River, providing a natural boundary with the mainland, and to the south are the steep slopes of Robin’s Nest or Hung Fa Leng. Until January, 2016 the village was not accessible except for the limited few as it was located in the Frontier Closed Area. The area has a long history of farming but most of the fields are now overgrown. The village has a road connection but this still passes through the Frontier Closed Area, restricting access to only those with suitable permits. Getting to Lin Ma Hang is a trek; quite literally, you have to walk in over the old village paths. There are a number of routes but they all involve climbing up and down a hill, taking about one hour each way. The village is quiet; there is no shop but there are new houses replacing the old. It feels remote until you look up and see the tower blocks and hear the traffic from over the boundary. The mine is located in the hills to the east of the village, following a series of mineral bearing veins through the slopes of Robin’s Nest. 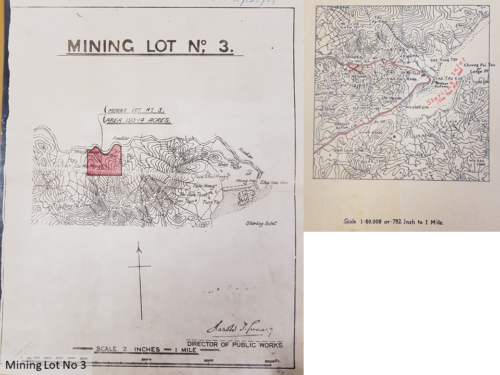 On the 24th July, 1913 Sir C P Chater wrote to the Director of Public Works, Mr W Chatham requesting a prospecting licence for limestone, gold and coal in the Sha Tau Kok mining district. 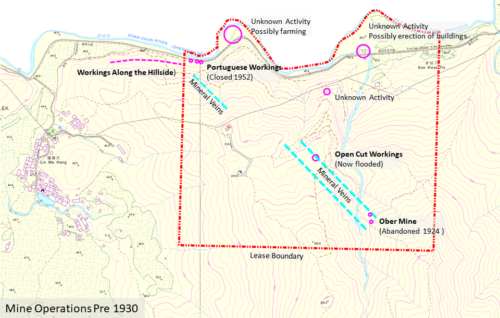 A prospecting licence was duly issued covering 150 acres or 61 hectares. Three months later, in October, 1913 Sir C P Chater requested the licence be extended to include lead, silver and copper. 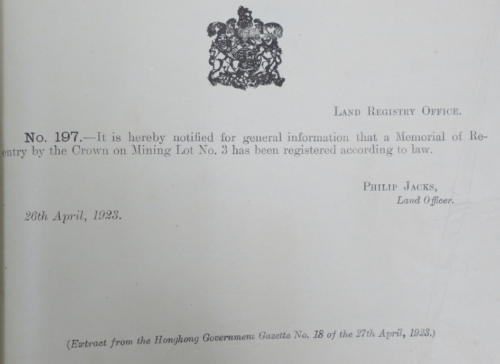 The amendment to the prospecting licence was duly approved by the Executive Council on the 6th November, 1913. Lead ore is recorded as being discovered in 1914 within the mining lot; a Mr Cheong is identified as having found the mineral. The lead was a mineralisation associated with the northwest-southwest trending quartz veins. Work then commenced on determining the extent of the mineral to establish if it would be commercially viable to extract. 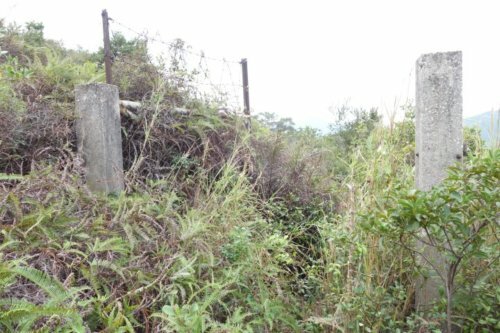 By 1916 work commenced to develop a mine, as recorded in the Report on the New Territories, “There was considerable activity at the mine near Lin Ma Hang. It is not possible to say if this venture will be a financial success but it has brought work and money into the Lin Ma Hang district, which was one of the poorest portions of the Territory”. 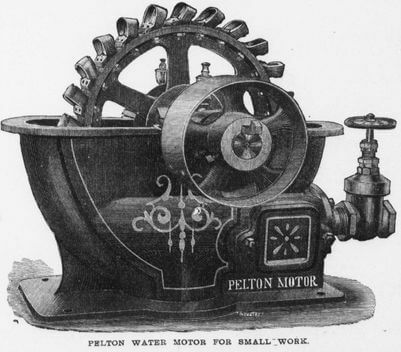 Development of the mine continued in 1917 including the provision of a small hydraulic powered engine using a pelton wheel to provide electricity. With a shortage of water during the winter months the development works were temporary suspended. It would seem the workers de-camped to Shing Mun to work on the new Needle Hill mine. With the prospect of a major mineral find, all but waiting to happen, Sir C P Chater applied for a licence to allow mining to commence. Thus, on the 28th August, 1918 a 75 year Mining Lease was issued for Mining Lot No 3 in the name of The China Mining and Smelting Company Limited, covering an area of 150.14 acres east of the village of Lin Ma Hang. It would seem that after the initial investment needed to start the mining operation, the results were a disappointment. The book ‘The Geology of Hong Kong’, records that the production of lead concentrates in 1915 was 100T, and this is most likely an accumulation of all the lead extracted up-until the 1920’s. Production from the mine did not meet expectations and the China Mining and Smelting Co Ltd became insolvent in 1921. 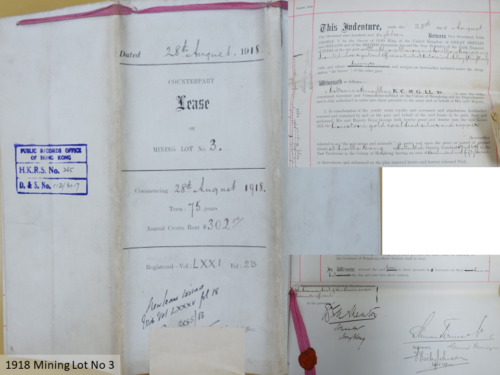 The Mining Lease for Mining Lot No 3 was sold by the liquidator in July 1921 to a consortium of R G Shawan, W Adamson and Tong Lai Chuen for the sum of HK$200. Under the lease conditions, the Colonial Government could re-possess or re-enter the mine if no bona fide work was undertaken at the mine for a period of 12 months. It seemed as if the new owners were not intending to invest in the mine. By 1923, the locals reported that there had been no work at the mine for 2-3 years and the Government considered re-entering the area. Following correspondence with the owners, it was confirmed that no work had been undertaken at the mine. However, they requested an extension of two to three years to establish a plan for development for the mine. Within Government it was suggested that the consortium wanted to hold on to the property until someone would buy them out. The re-entry documents were prepared and signed on the 26th April, 1923. Waiting in the wings was Mr Ober, an American who, in the words the Land Officer Philip Jacks had, “pottered about at various places in the NT”. He was interested in Mining Lot No 3 and claimed to be arranging “English capital – Jardine’s & others”. The question of safeguarding British interests was not lost on the Government. On the 5th July, 1923 Mr Ober was granted a mining licence for the Lin Ma Hang area by the Governor-In-Council. Mr Ober was funded by the Shewan Tomes group, one of the leading trading companies in Hong Kong and China during the late 19th and early 20th century. The licence was valid for 12 months, allowing the licencee to develop a mining area without committing to a full Mining Lease. 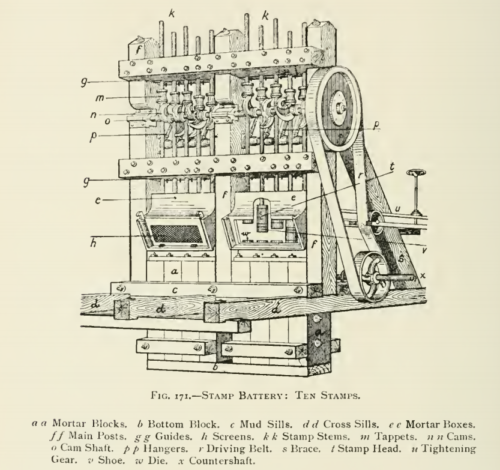 Mr Ober installed a six-stamp battery or crusher operated by electric power generated using the previously installed pelton wheel. An article in the Hongkong Telegraph noted that during this period the production was 20 piculs or 1200kg per day of 60% to 70% concentrate. In late 1924 the first aerial survey was undertaken of Hong Kong. The British naval ship, HMS Pegasus, anchored in Tolo Harbour photographed the whole of Hong Kong using sea planes which used the latest in aerial camera technology. One of the images taken on the 26th November, 1924 covered the Lin Ma Hang area. The aerial photograph is in a rather poor condition, but taken together with recent site visits and the 1964 paper on Lin Ma Hang it is possible to piece together the early mine activities at the site. Next to the border road, at a level of around +50mPD, a number of adits were excavated into the hillside. These are the lowest level of workings and are known as the Portuguese Workings. With the further development of the mine, these would later be known as the Level 1 workings. In ‘The Geology of Hong Kong’, Davis states that these workings date back to the beginning of the nineteenth century. Walking along the hillside, there are indications of extensive past excavation activities, possibly extracting the local rock for building It resembles limestone and may explain why the orginal prospecting application included limestone. If, as suggested lead had been mined over many years, it is strange that Chater and his team were unaware of it. It may be that the Portuguese Workings were for the stone and adopted to describe the location of the early adits. The Level 1 adits were bricked up in the 1950’s and now sit directly behind the boundary fence. In the centre of the Mining Lot, the aerial photograph indicates an area of activity, a spot of white within the dark image. Today the hillside is covered in trees but the old mining trails are still intact and some have been cleared, one assumes by other explorers. Approaching the site indicated on the aerial photograph, excavated stone can been seen within the slope, and with a bit of a stuggle through the bush you will encounter a large pond. This was probably an one cut excavation, locating the mineral vein and extracting the ore from the surface. It is now a small oasis for the local wild life. Futher to the southeast, on the hillside above a mountain stream, collapsed adits and workings can be found. These are refered to by Davis as the “Ober mine, has not been worked for more than 40 years”. These workings are difficult to access and I have yet to visit them, but others have which confirms their existence. 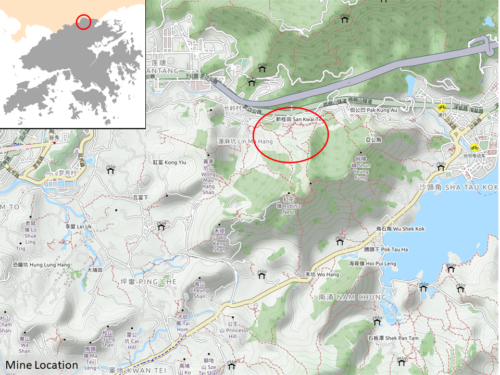 The aerial image indicates previous activities close to the Sham Chun river, and this could be farming, mineral processing or support facilities for the mine workings. These areas would be later used as part of the mine operation in the 1930’s. Dispite all this activity, Mr Ober was not successful and did not renew his mining licence. The mine was once more abandoned. Part 2 of this article will describe the development of the mine under Morrison Brown Yung. This article was first posted on 25th January 2018.